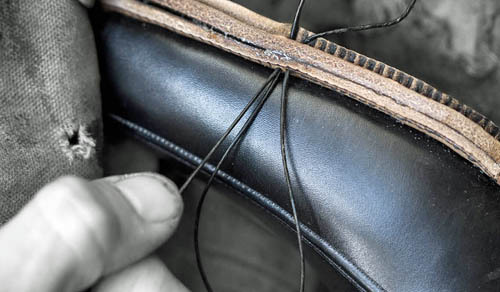 Bespoke Shoes Unlaced – a shoemaker's blog: A good 'awl'! So with Mr Ducker tanned and relaxed and safely back at the shoemaking bench, I have a little more time to show you how to tackle those ever-shrinking waists! In a recent post, James showed you how to really bring in the scoop of the waist so that you end up with a lovely narrow waist on the sole. But as I mentioned last week, getting a good curve on your welting awl is all-important to stitch the bevel waist at that point. Here is an example of my usual welting awl and my new small but perfectly curved waist awl. As you can see the lower awl has a much tighter bend on it, which allows me to scoop right in at the waist, especially on the inside waist where the curve of the last is much steeper anyway. How did I do it? A hot flame and some significant breath holding! 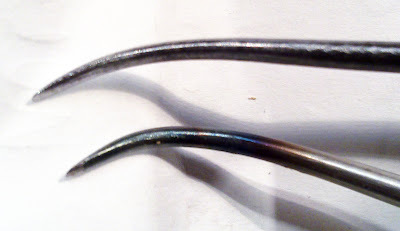 Heat your awl blade over your burner until it blackens. Now using a pair of pliers hold a good length of the end of the awl and gently - VERY gently - apply pressure to it to bend it. The rule here is a little at a time. Keep putting it into the flame and as you apply pressure you will see it gradually begin to curve. Top tips are: don't hold it to close to the end of the awl or it will snap; don't bend it too hard or it will snap; don't bend it when it is cool or it will snap...you get the picture a little at a time. But it is worth the effort because it makes stitching those beautifully curved bevel waists so much easier! until then have a great weekend, happy bending and happy shoemaking! Barkan Desert Boots Campaign is Live! Copyright Carreducker London Limited 2015. Simple theme. Powered by Blogger.